The prolific A.J. Fernandez made headlines with his collaborations lately, including with General Cigar’s Hoyo de Monterrey line. Largely unnoticed, however, is that A.J. Fernandez and General Cigar had been affiliated (albeit indirectly) for many years through A.J. Fernandez-made private label brands, including Diesel. 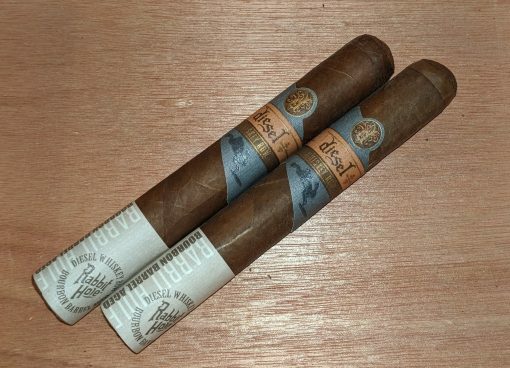 Diesel was originally a private label made for Cigars International (and its portfolio of sites, including Cigar.com and CigarBid.com) starting in 2009. Cigars International was purchased by then General Cigar parent company Swedish Match in 2007. Eventually, Swedish Match merged its pipe and cigar businesses with Scandinavian Tobacco Group (STG), putting General Cigar and Cigars International under the same umbrella, even after Swedish Match sold off its share in the company. Those close connections explain the integration of some Diesel lines with General Cigar, something that started in ernest last year with Diesel Grind. That was followed up earlier this year by Diesel Whiskey Row, which uses binder tobacco aged in bourbon barrels that previously held Rabbit Hole Bourbon. In addition to the bourbon barrel-aged Mexican San Andrés binder, Diesel Whiskey row uses a three-region blend of Nicaraguan tobaccos from Ometepe, Condega, and Jalapa, each aged five to eight years. Surrounding it all is an attractive, reddish-brown, five-year-old Ecuadorian Habano wrapper. The three Robustos ($7.50) I smoked had rich pre-light aromas featuring wood and earth but, notably, little that is distinctly bourbon-y. That would be a theme throughout the cigar which, despite its full-bodied flavors, doesn’t showcase the bourbon barrel-aged tobaccos as much as you might expect. Leather notes dominate and combine with white pepper, oak, and black coffee. The finish is long with tannic leather notes. From start to finish, the leather creates a slightly unbalanced element to the cigar’s full-bodied cigars. I didn’t have any Rabbit Hole Bourbon (it isn’t sold in Virginia where I live), but I did have an excellent Four Rose Private Selection that paired well with Diesel Whiskey Row. It may have limited bourbon notes, but the Diesel Whiskey Row Robusto earns a rating of three and a half stogies out of five.